To make sure you get the best deal we'll show you great prices from all of our drivers, including DDL REMOVALS, if they're available on the day of your move. Have a question for DDL REMOVALS? No problem, send them a message and they'll email you back as soon as possible. If you have a more general question you might find it answered in the FAQ, or you always contact one of our brilliant customer service team. * DDL REMOVALS won't be able to see your email address. Reliable fast and friendly service baased in SM6 delivering anywhere around the UK. 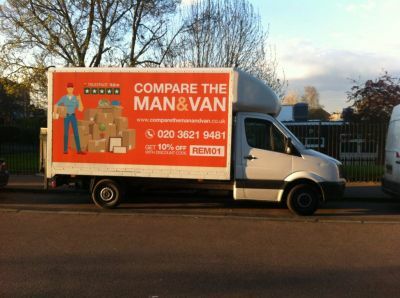 building a great reputation with Compare the man and van. Very nice guys and friendly and very careful with the items. Made the whole move a much easier experience. Thanks! Terry and his mate were excellent. Worked really hard all day and nothing was too much trouble! Made moving really stress free! Great Job - worked tirelessly to get us moved - thanks! Great service. Met at venue on time. Really prompt and careful loading. Would certainly recommend. Terry is great. I would highly recommend. Great service and communication. Delighted with the professionalism. driver was on time. i was charged for stairs even tho i was unable to add that to the drop down menu as you can only pick from" 1-8+ stairs or lift" no option to add extras, move took longer than expected, i left around 20-30mins after driver and arrived before driver, driver also spent time talking to a neighbour which contributed to time going over so had to pay extra again, driver also snapped off a couple feet off my sofa and disposed of the evidence as could not find the feet afterwards. the driver also stated that he could park on single/double yellows and "it would be fine" but beware, it is not "fine" you, the customer, would have to pay for any parking tickets. Terry was very professional and friendly, arrived on time, with straps/blankets and loaded/unloaded very well, would highly recommend and use again. Many thanks again! Gret driver. Good communication and helped me out when I made some mistakes. Will use him again and would definitely recommend. Booked for flat move with heavy bulky items and then other random sized boxes and cases. Great guys, friendly, super helpful and very efficient. Couldn't ask for a better service and would definitely recommend. Most excellent, couldn't want for more. It was collect from a single location and deliver to 4 different locations, some many miles apart and it went as smooth as you could wish for. Terry and his son Levi were very friendly, professional and efficient. Highly recommended. Terry & Levi were great. Very professional, helpful & friendly. I would recommend to all. A big thank you! Terry and Levi did a fantastic job of our move. We would definitely use them again in the future. Excellent service from start to finish. A pleasure. Thanks a lot. Terry was excellent - really friendly, great company and was really understanding with our cat! A quick and efficient service - would recommend every time. Terry was simply fantastic. He arrived early, was polite and highly competent, knowledgeable and careful. He worked incredibly hard loading a LOT of heavy boxes and then drove hundreds of miles and then unloaded it all perfectly and with a smile. Really impressed and a lovely guy on top. I almost want to move house again just so I can use Terry! Terry and Levi were fantastic, and for good reason they already have excelling reviews. They know what they're doing, they are friendly and efficient. I've had some experiences with moving/delivery companies that make you feel embarrassed or stupid if you've done something 'wrong' or when you ask certain questions. These guys were totally respectful and helpful. You can't go wrong with these guys. Terry was fantastic from start to finish, made a long move very straight forward! All went well, the guys were really friendly and helpful at both ends of the move. If I could rate 1,000 stars I would!!! Terry helped me move from Croydon to York and was way better than the last people I used on here to help move items. All of my property was handled with absolute care and respect, in short, he took away ALL the stress that comes with moving. Seriously deserves more than 5 stars, Thank you so much Terry!! Amazing service from a wonderful driver! He was friendly and accommodating, very hard working and on time. We would definitely book him again! You read the reviews and think he can’t be that nice. But he is and the experience is professional and yet personal. Great lads thanks for picking up for me it’s appreciated. Everything went smoothly. Despite major hold ups on the motorway, they arrived in good time and could not have been more helpful. So pleased to have discovered this service. Life changer! Terry and Levi were great, really friendly and helpful. Journey was a decently long one and spent the time having a chat and a laugh. Couldn't have asked for better, will definitely use them again in future. Brilliant. We couldn't have chosen any better. Terry was fantastic. We will recommend him to our friends and would not hesitate to use him again in the future. Terry and Levi were brilliant. Professional and friendly throughout and had the job finished hours before we'd expected to be done! Thoroughly recommend! Fantastic movers. Terry was polite, funny, and extremely professional. Very highly recommended! Terry and team were brilliant. Polite, helpful and considerate and completed the job an hour earlier than expected. Brilliant. Would definite recommend them. Excellent service. Punctual (despite the pick up point not even being on the sat nav as it’s a new building), efficient and very friendly. I thoroughly recommend this company. I’ve used it before and would do so again without hesitation. Terry was excellent. Took down a piece of equipment. Highly Recommended him to anyone. Very Professional.! Great team, on time, helpful would recommend. Terry was a great guy and nothing was to much. Would recommend to anybody. 5 star! Terry and his son Levi turned up early, were very friendly, courteous and discussed the move with us before getting stuck in. They were super fast and efficient loading and unloading and very carful with our belongings. Fantastic service that we would definitely use again. Thanks guys you made our move seamless and stress free. Fantastic move - quick and courteous service, everything went smoothly, very happy. Terry was on time and very helpful. He made our move very smooth with no complications. Would definitely recommend! Thanks for your help! Terry was fantastic. Showed up on time, got the van packed quickly, very friendly. Highly recommend. Great service, also it was a nice bonus to have a driver so easy to chat to on the 4 hour journey to Sheffield. Excellent service & very experienced. Would certainly use again & recommend. Brilliant guy. Couldn't have been more helpful. Very professional. Really knows his stuff and looked after my property very carefully. Refreshingly efficient. I had a fantastic move, and would definitely suggest to any of my friends and colleagues. Super friendly and helpful! Great service! Terry was very friendly, helpful & knowledgeable about his job. Made the move as straightforward as it could be. Terry was prompt, helpful and very easy to work with. I would use him again. Very good driver, great service. I would highly recommend Terry and his son. They were very professional, hard working and made our move as stress free as humanly possible!! Thank you Terry and Levi!! Excellent move, a master at manoeuvring large furniture through tight spaces, would recommend them any day. Really professional, friendly and fast. Terry was brilliant. Would recommend to anyone to use. Top guy and great service. Thank you! Really great service, very careful with everything. Will definitely use them again and highly recommend. Terry and his son were great. We had some difficult items to move into some very tight spaces and they did their very best to accommodate us. They were on time and worked within the time allowance we had booked. Terry and his son were so friendly and helpful.He was careful and respectful with items that were fragile. I had a couple of difficult pieces of furniture and he solved these issues with ingenuity and creativity. I would highly recommend Terry to anyone thinking of moving. Thanks for making it such a smooth process! I can't rate the service Terry and his son provided highly enough! They were on time, very accommodating of my haphazard packing, friendly and made clear early on additional costs I was likely to incur (as a result of my own miscalculations). Would highly recommend and will use again if needed. Terry was absolutely lovely, really helpful and had checked about the size of van the evening before. Thanks Terry. Excellent job done, would thoroughly recommend and will be using Terry again! He was very friendly, very helpful and very efficient. Also very professional, making this the most seamless house move that I have ever undertaken. I would recommend this driver to anyone wanting to move.